Are you a FliteTest fanatic who always wanted to build a toy plane of your own but had no clue where to begin? Hobby Shop RC Hyderabad in Tolichowki is an answer to all your plane prayers. Also known as RC Toys Hyderabad, this hobby shop caters to all hobby enthusiasts, beginners as well as pros who are interested in building a toy car or a plane. Khaled Bakhtiar, who owns the store, is a trained professional and encourages the art of DIY. 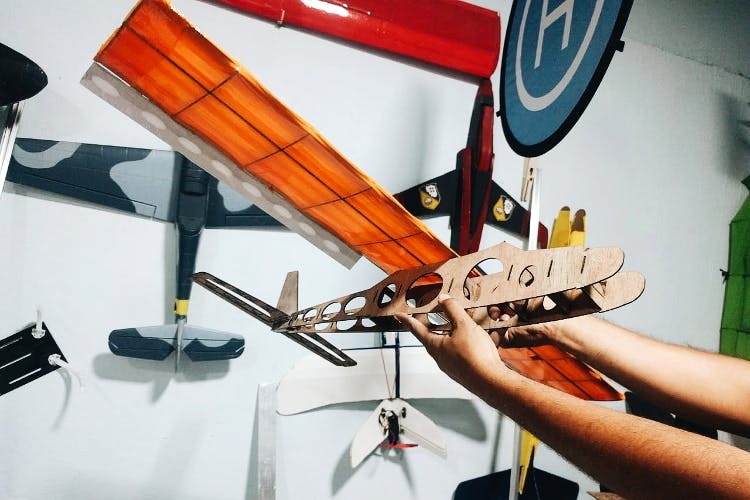 At the store, you can pick an FT Sparrow — ideal (And fun) for a beginner to build a plane, RC controllers, transmitters, machine laser cut boards as well as a comprehensive DIY toolkit. The kits are usually custom-built to match your requirement and if you don't want to build your toy from the scratch, no problemo! For the store also offers to cut the foam boards to match the size and shape of your toy. Easy peasy, ain't it? The prices aren't too steep and a basic toolkit will cost you around INR 1,500-2,000. Sure there are expensive toolkits too, but if you are a beginner, you know where to start. More display options of RC cars would be great. Khaled is quite passionate about the store and if you're stuck somewhere or need instructions on how to get started, chat with him.